Nothing like a great tribute video set to music like this, am I right? The best of the bunch is probably the breakaway save on Sedin. I'll always remember that one. Lately I've been trying to cut back a little further on my eBay spending by only looking for really great deals that are hard to pass up. That usually means placing an opening bid of $0.99 and if I win great, it not no big deal. This latest pickup has been the most surprising that I've done that with. I was sure this one would not end with just one bid, but sure enough it did and now I can knock off another one of the many parallel versions from this set. At this point I'm not sure how many there are with all the jersey, prime patches, autos and what not. All I know is they all use the exact same design, only changing the foil color and the cutout window. Let's look at what this card would've effectively cost someone when it was pulled. Assuming the current retail price of a box of Dominion to be around $275, if you divide the cost of eight cards evenly, that's $34.38 per card. Given that this is probably one of the "hits" you can probably bump that up a bit knowing the base cards aren't worth as much. I ended up paying $0.99 for this card, plus $3.00 for shipping. For a player collector like me, I love that this product has so little value, but the rest of the collecting world may look at it differently. What do you guys think? To put things further into perspective, I only paid a few more dollars for the nameplate version of this card numbered to just 25 copies. As often as I can, I try to buy the cards for this and other sets like it in lots to save on shipping costs. This time I was able to pick up six out of seven from a particular seller on eBay. Doing that saved me $2.50 shipping on five of the six cards, so in the end I only paid $5.94 for the six cards plus $4.25 for shipping them. Anyway, the first is this Patric Kjellberg numbered 017/100. Its got a standard full body action shot of Kjellberg skating up the ice in his home white Predators jersey. I like that he's the only player you can see as it makes him stand out a bit better. 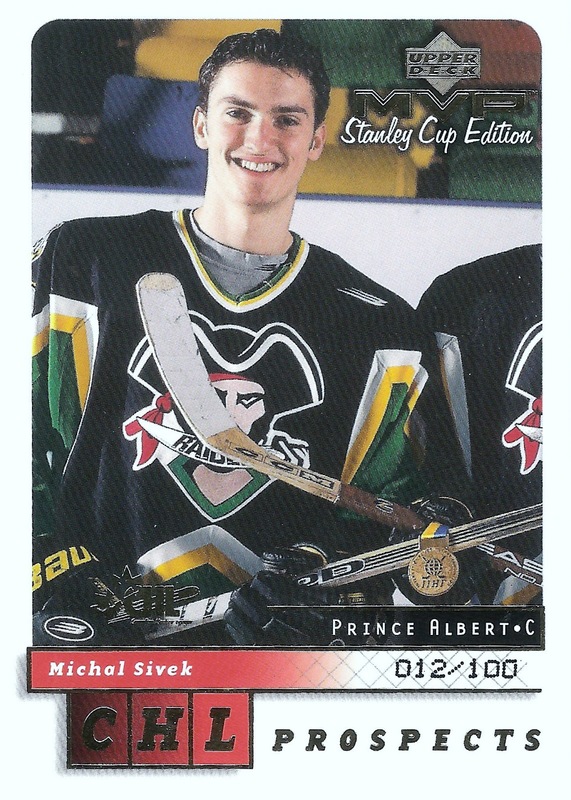 Then there is this Michal Sivek numbered 012/100. This is another one of the CHL prospects subset cards, which all have a silver foil CHL logo in place of the facsimile signature. The picture is neat on this one because the Milan Kraft has the other half of the picture. The next one is this Tommy Westlund numbered 064/100. This is another one with a nice full body action shot making for a much better overall look. As far as the facsimile auto, it's a bit better looking than the Kjellberg, but still not what you would consider a great sig. 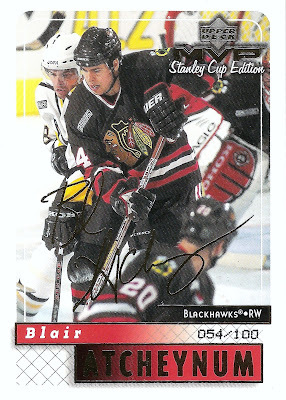 Then there was this Blair Atcheynum numbered 054/100. This is one of the cards where the photo is a bit crowded as you've got players in the foreground and background taking away from the player actually being featured on the card. The next one was this Aaron Miller numbered 079/100. Back to the nice full body action shot here, plus you can see the puck on Miller's stick so that's kind of neat. Again not a great looking signature, but it's still one to cross off the want list so I'll take it. Finally there was this Garry Galley numbered 064/100, which looks great next to it's Super Script counterpart. Now I just need the Silver Script Galley (same goes for Joe Thornton) and I'll have another rainbow for the collection. These six bring the Gold Script total to 42 out of 220. This puts me just under the 20% mark for the Golds. Pretty decent progress for such an old set if you ask me. The hard part is going to be getting some of the bigger name players (i.e. 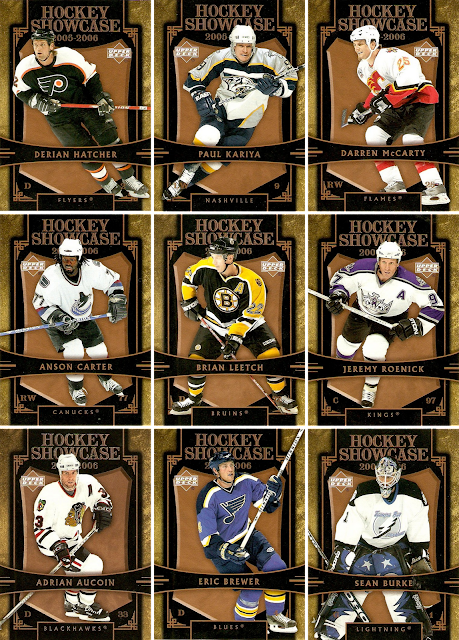 Yzerman, Roy, etc) as a lot of these cards are locked up in current player collections. At first I was like "what the...?" 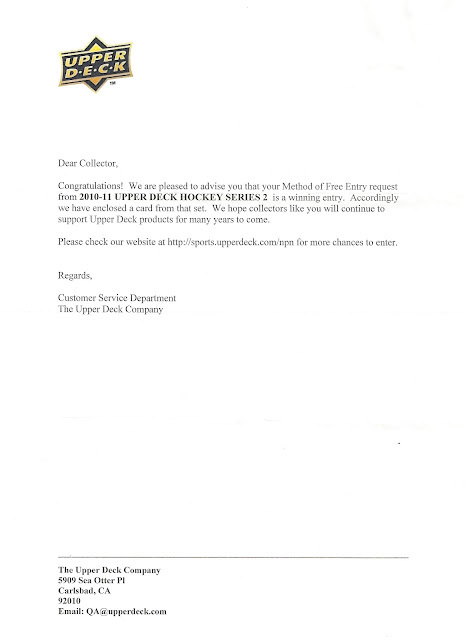 but then I saw the form letter from Upper Deck behind the card and remembered that I had entered a bunch of the hockey NPN contests on the website. Not bad for just having to sign up for an account with UD and click a few buttons. I'm guessing UD sent out a huge lot of these lately because I've seen a few posts over at SCF and on other blogs about other NPN successes. Not sure what they typically send out with these, but I'll take a card numbered to 100 for free any day of the week. Anyone else enter these things and more importantly have you won anything? As far as I can remember, this is the first time I've got anything from one of these. I haven't come up with any custom card designs for a little while now, mostly because I never have time to work on them, but partly because I didn't have any new and exciting ideas to work with. 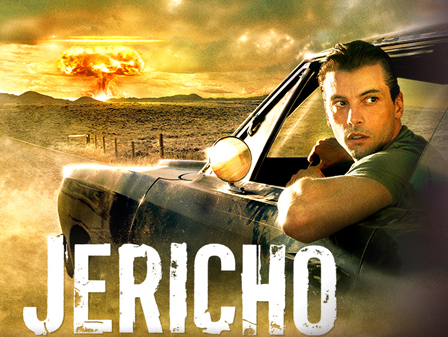 Well, that changed when I stumbled across my new favorite TV show, Jericho, a few months back while browsing Netflix during my Christmas vacation. Here's a quick summary of what the show is all about from IMDB: "After a series of terrorist attacks leave the US in a state of disaster. A small Kansas town must come together to deal with a new reality." I highly recommend that you check it out and give it a chance. Now for the custom cards I came up with. 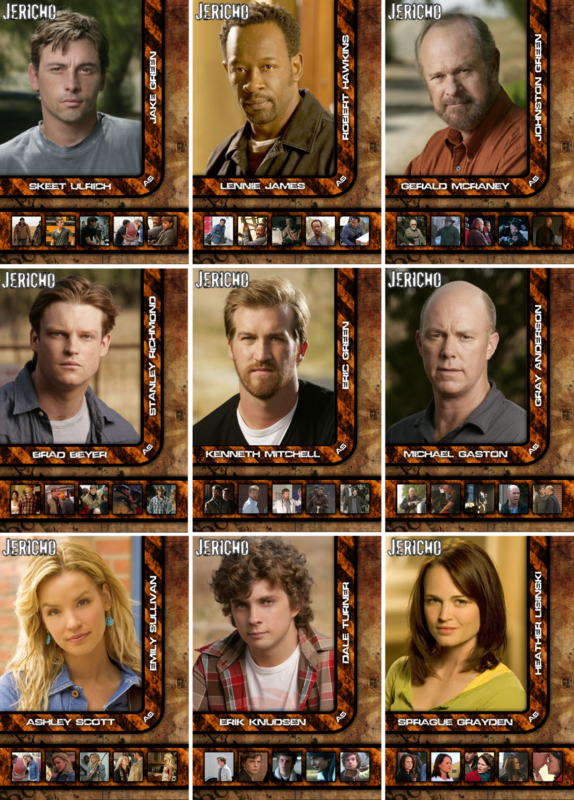 I should mention that there is a trading card set already out there from the first season of the show and I kind of used that for inspiration in getting started with my initial concept design. Beyond that I just threw together some ideas and it eventually turned into what I have here. Since Jericho is a post-apocalyptic kind of show, I wanted to start with a grungy looking background and that's what I used as the base layer. While I was searching for that, I came across the caution tape looking wallpaper and decided to try and work that in somehow. As you can see, I used it behind the character/actor names as well as the thumbnail image bar across the bottom of each card. The idea with that was to contrast the studio-quality head shots with some live action shots taken directly from some of the episodes. It came out looking better than I thought it would. Other than that, I made an editable copy of the Jericho word-mark and placed it in the upper left corner to complete the design. What do you guys think? I know it's not the usual here, but I wanted to try something different and work in another one of my interests, other than hockey of course. By the way, have any of you watched, or even heard of Jericho? If not, check it out. When it comes to collecting, I'm sure some of you have some superstitions like not grabbing the last pack of an opened box or making sure you get the bottom pack of a freshly opened box at the hobby shop. The biggest one I deal with is not crossing a card off of my wantlist or showing it off before I actually have it in hand. For some reason, I feel that if I do that prematurely, I'll jinx myself and the card will either get lost in the mail or show up damaged. I know it's good to mark things as incoming sometimes, but for me I simply wait until I have the card in hand before doing anything. It's the same way with showing something off here or over at SCF. I will wait until I have the card to be able to scan it myself. Up to this point it works, knock on wood, as I've yet to have a card I either waited to scan or check off the list go missing or show up in bad shape. Am I the only one that thinks like this? Do you have any collecting superstitions? It's almost March now and I'm still enjoying my Christmas presents, well at least one of them. 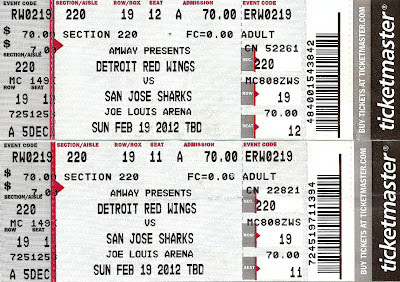 I got a pair of Wings tickets way back in December for a game that seemed like forever away. 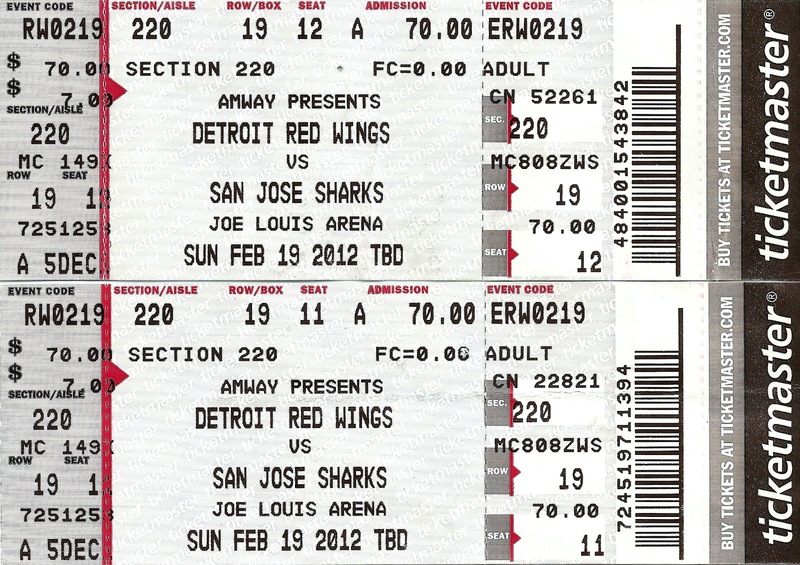 That day came and went yesterday as the Wings hosted the San Jose Sharks down at Joe Louis Arena for a Sunday matinee. Here's a look at the view from section 220. Not bad. We were on the end of the rink where the Wings were in the offensive zone twice. This means I had a great view of the first goal of the game as well as the eventual winning goal by Darren Helm in the third period. In case any of you live in a cave when it comes to the NHL lately, this was the Wings 23rd consecutive win on home ice. It was also the last game in a long home stand for the Wings. This could very well have been the game that sets the record, hopefully not though, so I figured a picture of the scoreboard at the end of the game would be pretty neat. All in all, it was a great day as the weather was decent, we had some great pizza across the street from the Joe before the game, and the Wings kept the streak alive. Plus, even with a 45 minute drive home from the game, we were home before dinner time, something that doesn't happen all that ofter with the usual 7:30 start times. So that was the highlight of my weekend. Anyone else make it to any other games lately? Been on the road for work all week, so it's nice to finally get a break to post something here. Luckily I had these scans already saved in the draft of this post, and since it was the only one with them, it only made sense to post it now. Anyway, here's another sub-theme for the project: all things red, white and blue that don't belong. 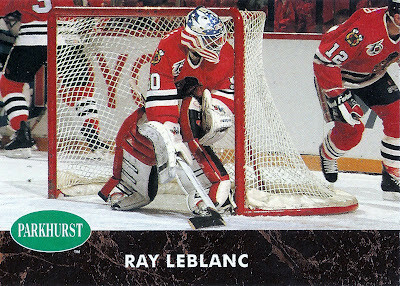 The first is this Ray LeBlanc from 1992-93 Parkhurst. 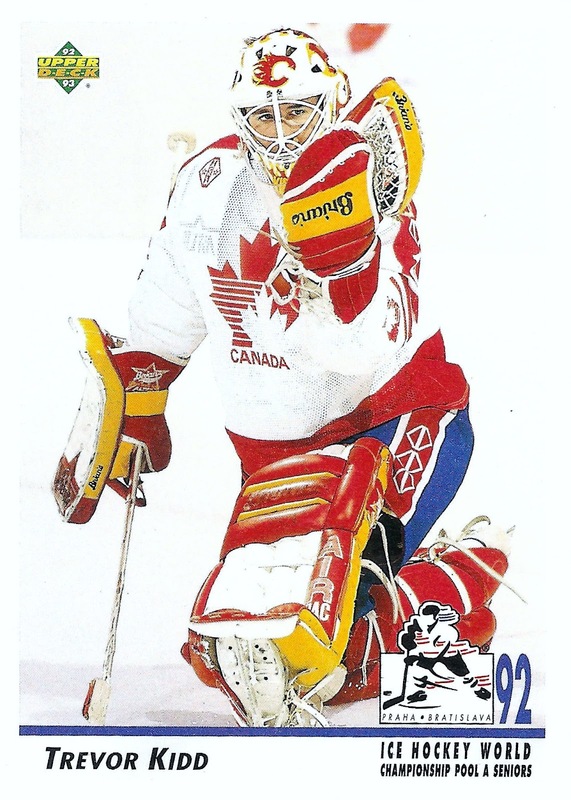 LeBlanc is best known for his 5-2-1, two shutout performance at the 1992 Winter Olympics in Albertville, France. 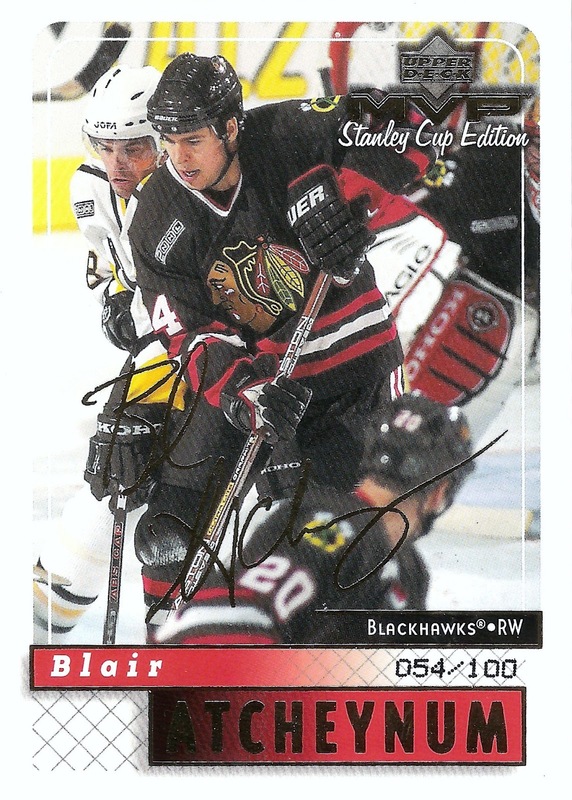 He bounced around the minors and only played a single NHL game with the Blackhawks in 1992. 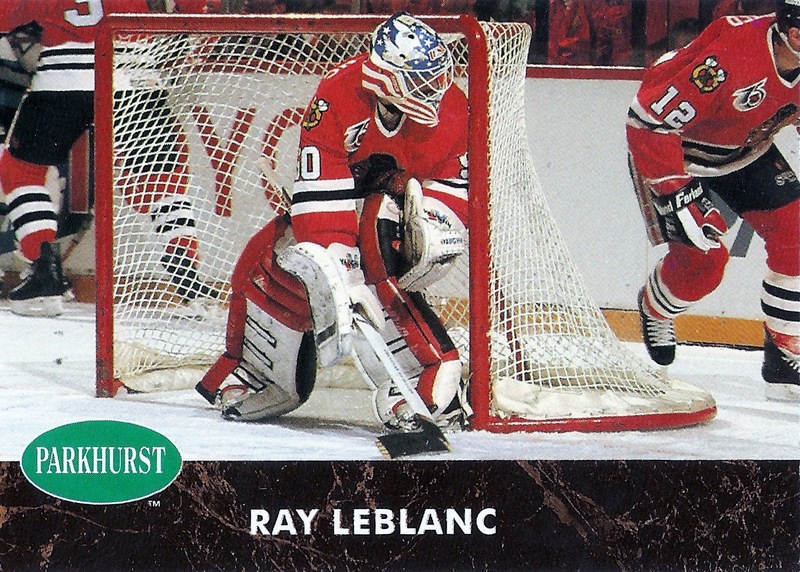 In that one game, LeBlanc had pads and gloves that went with the Blackhawks color scheme. 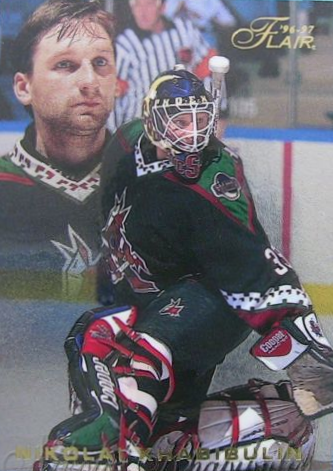 Beyond that, and the reason the card is here, he wore his team USA mask. 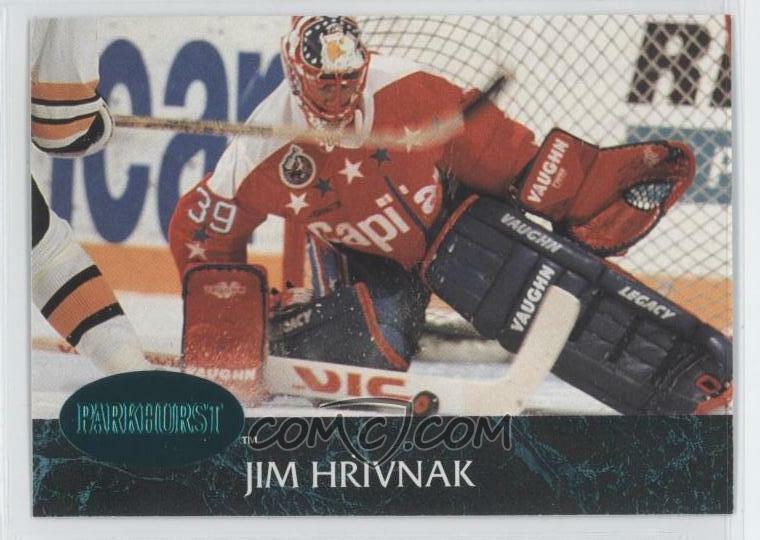 The second is this Jim Hrivnak from 1993-94 Leaf. 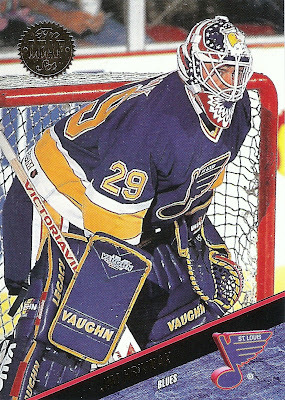 The card shows him with the St. Louis Blues, for which he has matching pads and gloves, but that's not the case with his mask. It's a little too patriotic for the Blues, but it fit perfectly with his Capitals equipment from the season before. Click here to get a better look at that. I like finding little sub-themes to the project like this. Maybe I should come up with some way of organizing all of the cards I've got so far. Either way, these are two welcome additions to the project as I close in on the 100 mark. Hopefully I can make it out to another card show here soon to bring myself even closer to that mark. Goaltending Gallimaufry: Are You Kidding Me? Happy Friday everyone, and sorry for the corny title, but I had to do something as this post is about a new twist on the project. First of all, thanks to Chris over at Flamestuff, another great hockey card blog you should check out, for pointing out and previously sharing these two beauties. Click here for the original post. Luckily, I was able to find both of them in one of my 90's monster boxes full of junk wax base cards. The first is this Trevor Kidd from a 1992-93 Upper Deck subset, showing him in the 1992 Ice Hockey World Championship with Team Canada. The reason this card works for the project is the mismatch between his Flames equipment and the Team Canada colors. Plus, what's the deal with the blue pants? Isn't Canada always just red and white? 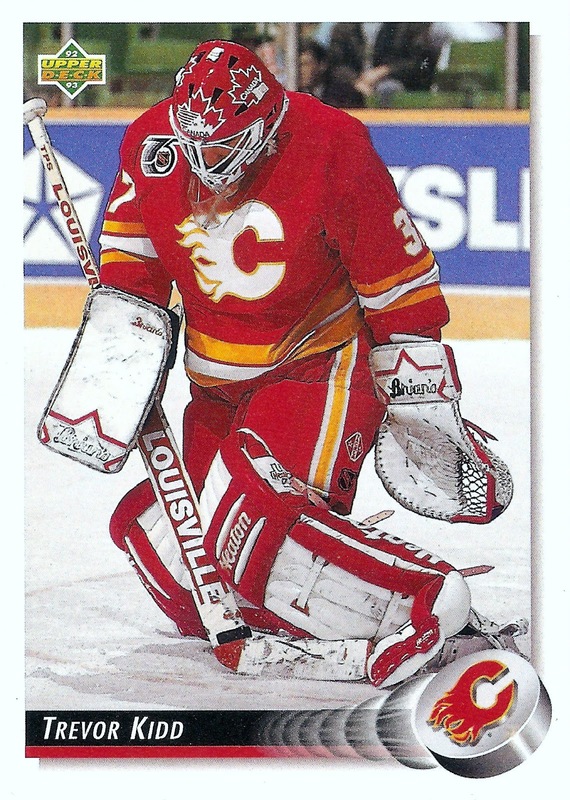 Now, where this gets weird is the next card, also a Trevor Kidd from 1992-93 Upper Deck, this time showing him with his NHL team the Calgary Flames. In this one he's wearing Team Canada colored pads and a blatantly obvious Team Canada mask. What's up with that? Why does he have the exact opposite of what he should in both pictures? So there you have it, another interesting twist in the world of mismatched goaltender equipment. Pretty interesting, isn't it? I guess you never know what you'll find with a project like this, and that's what I love about it. Plus it's cheap, and I get to share some of the most random cards this way. It's been a little while now since I've done one of these, since September actually, but as I was sorting through some of my Red Wings cards recently I came across one I had to share. 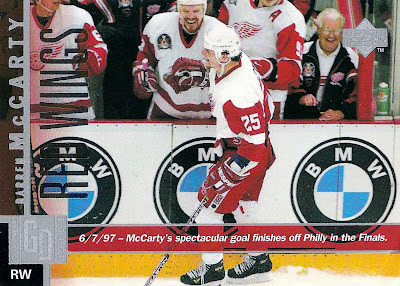 It's a Darren McCarty from 1997-98 Upper Deck. It's another one of those game dated cards, the fourth one I've done now. The caption on this one says it all. Now for the video. It's a bit hard to see, but around the 1:07 mark you can see McCarty skating in front of the Wings bench from a camera in the stands behind the bench. It's the exact opposite viewpoint of the shot on the card, so it's kind of neat to get another perspective of the moment captured here. Watching that replay never gets old. It's one of those moments I will never forget as a Red Wings fan. 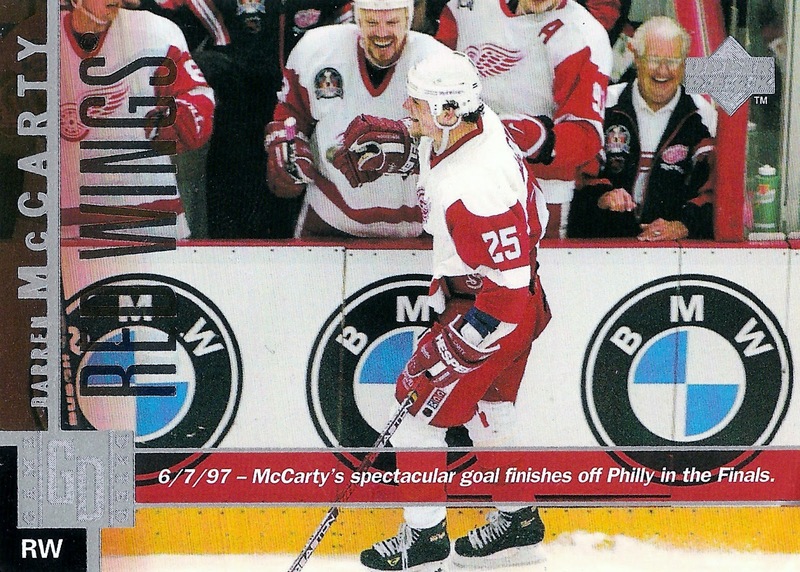 Other than Yzerman hoisting the Cup at the end of the game, this was probably the most memorable highlight of the entire playoff run for the Wings that year. 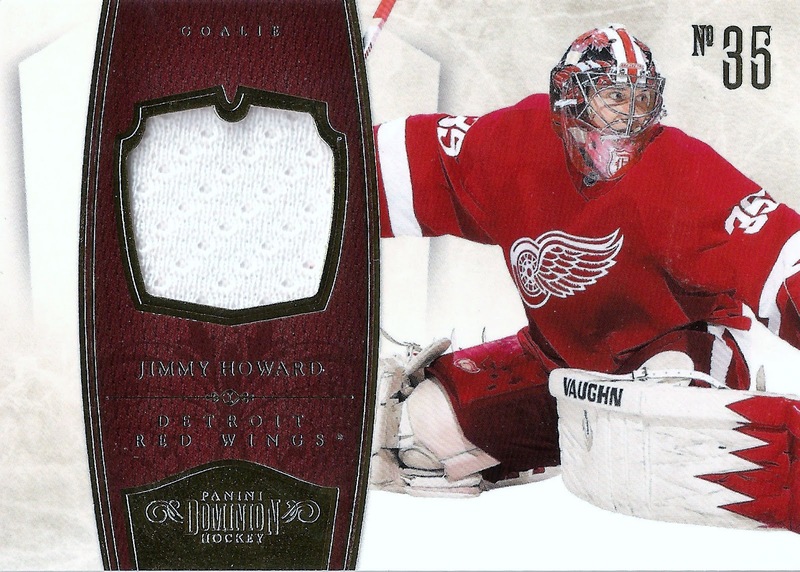 Lately I've been cutting back on Jimmy Howard purchases because his stock is rising with the way he's played therefore demand is up meaning prices are up. Hopefully that will cool off when summer comes around and I can get some decent cards on the cheaper side when the focus is elsewhere in the world of sports. That doesn't mean I won't jump on a good deal when I can though. This one would fall in that category as I managed to get it for only $4 with free shipping. 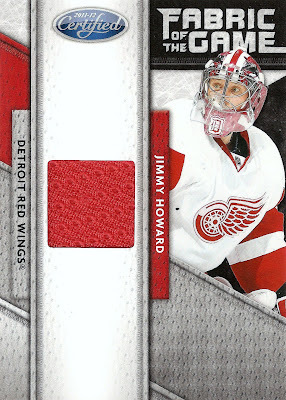 It's a 2011-12 Certified Fabric of the Game single jersey swatch numbered 197/399. 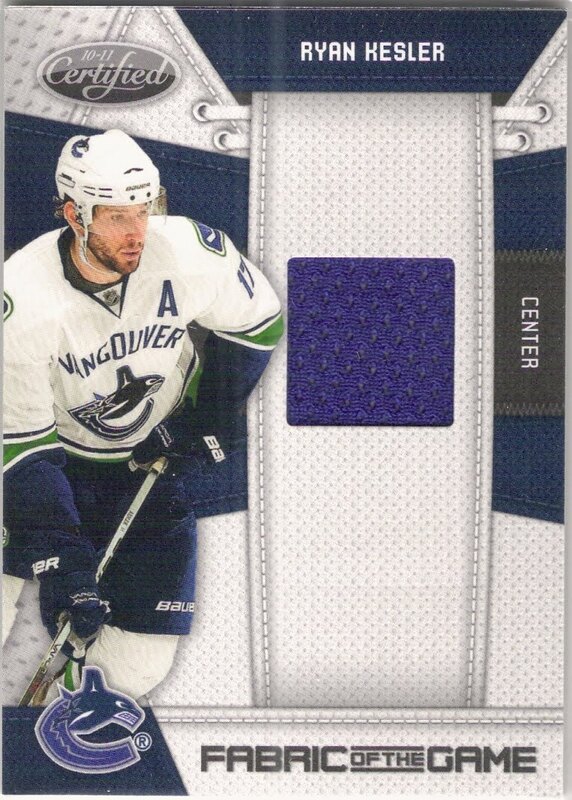 While there are parts of this design I like, including the "Fabric of the Game" text and the jersey mesh texture on the card, overall this card is kind of underwhelming. 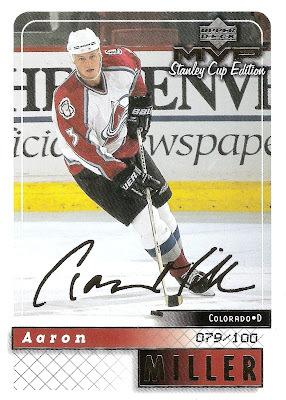 That's only because of Panini's typical cookie-cutter design where they change absolutely nothing before adding a sticker and calling something an autographed parallel. This design is definitely a downgrade over the 2010-11 design. Click here for a look at one of those. 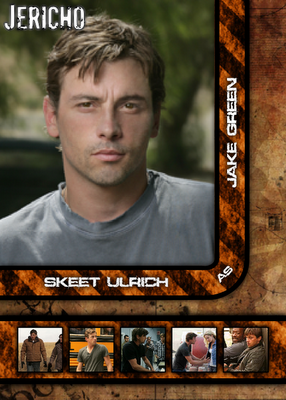 At least there, the bottom of the card is brought together with the team logo and set name text. On the 2011-12 version, the bottom is left vacant on the non-auto versions, making for an awful overall look. Despite how I feel about the design, it's still a nice addition to my Howard collection, plus I got it for what I think was a great price. It's brings the collection total to 108 cards. Here's another one that's been sitting in draft status for a while, and since I don't have access to my scanner at the moment, it will have to do for now. This one is probably my favorite non-Red Wings jersey with a name and number on the back. It's an old school Coyotes Nikolai Khabibulin jersey. I got it several years ago from a garage sale for like $10 or something. All things considered, it was in great shape and still is today. This is one of my favorites because I always loved the Coyotes logos as a kid, plus it fits me perfectly, so I wear it quite often compared to some of the other jerseys in my collection. I absolutely love this jersey and it's white counterpart (I have that one too) although some people would disagree and say it's too cartoonish and what not. I love the Coyotes logo on the front, especially the mix of colors that they worked into it. Add to that some sharp shoulder patches and a unique patter on the arms and waist, and you've got a great overall look. At least that's how I feel, what do you guys think? The back is pretty straightforward on this one with the name and number in addition to the Western Conference and manufacturer logos at the bottom. I really like that they went with the tan color on this one. If only they went with that color for the opposite jersey (think Rangers Winter Classic jersey), instead of the white. Now that would've been cool and unique at the time. 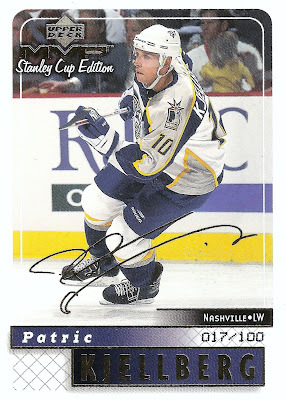 This time I had a card floating around my PC with the same jersey, minus one detail that only a perfectionist or die-hard jersey collector would notice or care about. It's not easy to notice from the card, but the numbering is in the wrong font on the back of my jersey. It looks like it was homemade, so that's probably why, but I still wonder how they got numbers that look so close to the real thing, yet so different. Click here to see what I mean. That's four of these down now. No more left in draft status, so I need to get a few more of them out of the closet and photographed so I can show them off. Not sure what I should show off next, I've got about 15 more to chose from, so you'll just have to wait and see. I've been meaning to do this post for a while now, but never really had the time for it until now. First though, if you haven't noticed, I changed the tracker on the sidebar for this project. Now I just want either the pewter or the bronze version for any given card. This eliminates any confusion. The two versions look close enough to each other that I want to just build one set, even if it is a mix of the two. This first group is definitely an interesting mix of players. I believe the idea of the set was to focus on players that changed teams coming out of the lockout and into the 2005-06 season. Not sure why they didn't just go with all the biggest stars if they were trying to bring fans back into hockey again. 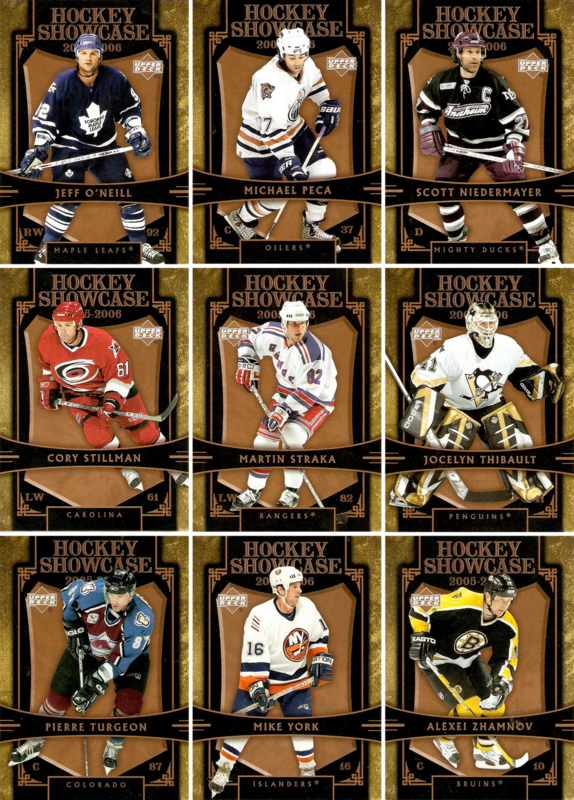 These, plus the Osgood I've already shared as one of my picks, bring me to the halfway mark on the Hockey Showcase front, with 20 of the 40 cards in the set. I'd say that's a pretty good start. Now I just need to work on getting some of the Rookie Showcase cards. Just got done with my second roller hockey game in the last 36 hours. We got annihilated in the first one, but came away with a last second 7-6 win in today's game. We're 3-1 on the season now. I've got 6 goals and 2 assists in four games, not a bad start at all. So even on Super Bowl Sunday, the only thing that matters to me is the game of hockey. Anyway, back to hockey cards now. While I didn't come up with a post here for my collecting goals for 2012, I do have a few and one was to get updated want lists on the blog for each of my PC projects. It's not that difficult, I'm just lazy and like to put this kind of housekeeping stuff off as long as possible. But now I'm finding myself wanting to do more trading, and I wanted a centralized list of everything I'm actively looking for. I've got all the sets updated now (MVP, Metal Universe, and Hockey/Rookie Showcase). 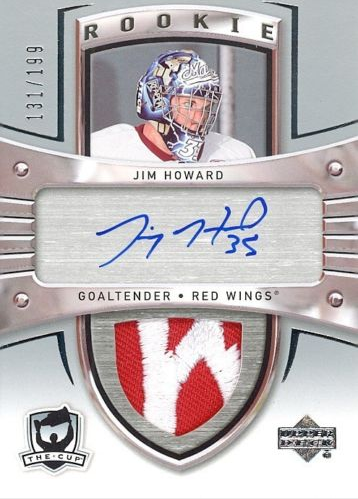 Other than that, I'm attempting to keep and updated Jimmy Howard want list, but it seems to keep jumping 20 cards with every new release lately. So that one will always be a work in progress. It's not completely up to date as of right now, but it's pretty close. Now I just need to update my trade list. Here's another one of my non-Red Wings jerseys. This time it's an old Florida Panthers third jersey with Pavel Bure's name and number on the back. This one was purchased while on my 7th grade field trip to Washington, DC at some fan shop in Baltimore. I say N/A below because I can't for the life of me even begin to think of the name of the place. I mean this was like ten or eleven years ago now. One thing I do remember was a selection of jerseys in the shop, but this was the one I settled on. The other two that come to mind were a Steve Yzerman Red Wings jersey and an Eric Lindros Flyers jersey. I already had several Wings jerseys, I never liked Lindros, and I always liked the Panthers logo and other two jerseys, so this was the choice I made. The best thing about the front of this particular jersey is the Panthers logo. 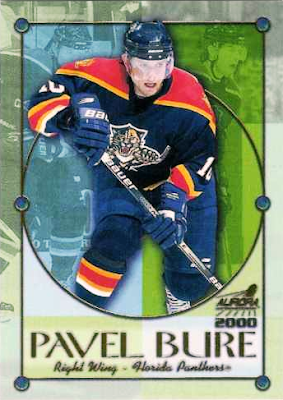 Back before the Reebok Edge era, when jerseys were actually cool, the Panthers did something neat and added the broken stick to the logo on their third jersey at the time, this blue one. I love the color combination here too, although I think they could've gone without the single white strip on the arms and waist line. While you couldn't see it on the front, you can see it here, and that would be what I think is one of the greatest shoulder patches ever. I know palm trees and sunshine are the first things that come to mind when you think of hockey, but I have to say here it just works, and looks awesome. Other than that, the back is pretty typical with the name and number plus the manufacturer and league logos on the bottom. 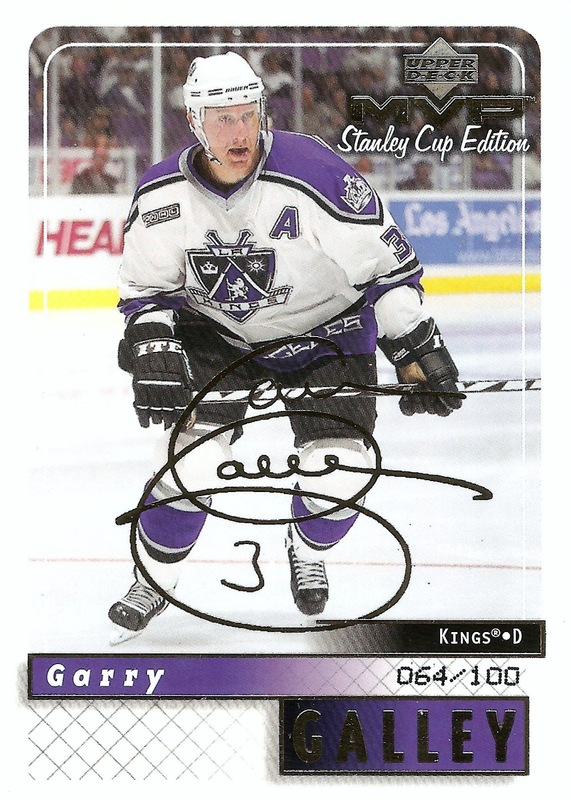 Now for a card with the same jersey. It was actually a bit difficult to track one down, because it looks like he wore the "A" most of the time in this jersey. At least that's what it seemed like when I was flipping through my Panthers binder looking for one. In fact, this isn't even one that I have, it was just the first one I came across on the web. So that's three of these down. I only have 20 or so left to get to, but I'll try and spread these out as best as I can. What do you think, do you want to see more of these? I think of it as a nice break from writing about just cards, plus I even found a way to work them into these posts, so it's not completely off topic. Thoughts: What Tops Your Want List? I was doing one of my daily eBay searches the other day and came across a card that I'm still looking to add to my Jimmy Howard collection. It's one of the biggies, an ARP (Auto Rookie Patch) from 2005-06 The Cup. 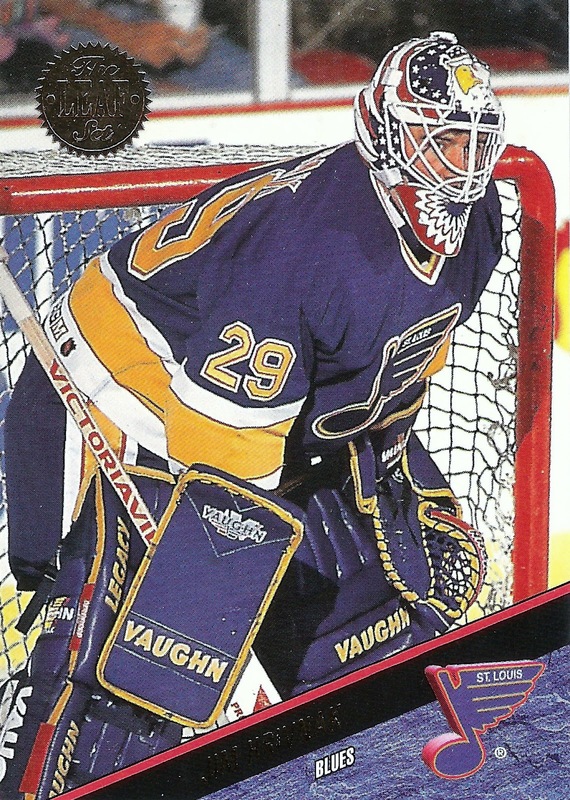 It's a beautiful card, depending on the swatch, and is definitely his most desirable rookie card. The only problem I have is trying to get one for a decent price. This one here just sold for more than $350. I know that's nowhere near the insane numbers the Crosby's and Ovechkin's go for, but it's quite a bit for a recent college grad that's just getting started in life. I don't have the ability to just throw money at this hobby without being conscious of what I'm actually spending. I mean so far the most I've spent on a single card has been $50. That said, this card still tops my want list and probably will for a while, unless I come across a deal that I can't pass up. While I could go for a cheaper plain white swatch, that just wouldn't cut it, so I'll hold out for a decent one like this. Now I'm curious, what is that one card you just have to have for your collection, and more importantly why? Is it a high-end rookie like this, a hard to find vintage card, or just something to complete a set you've been working on?